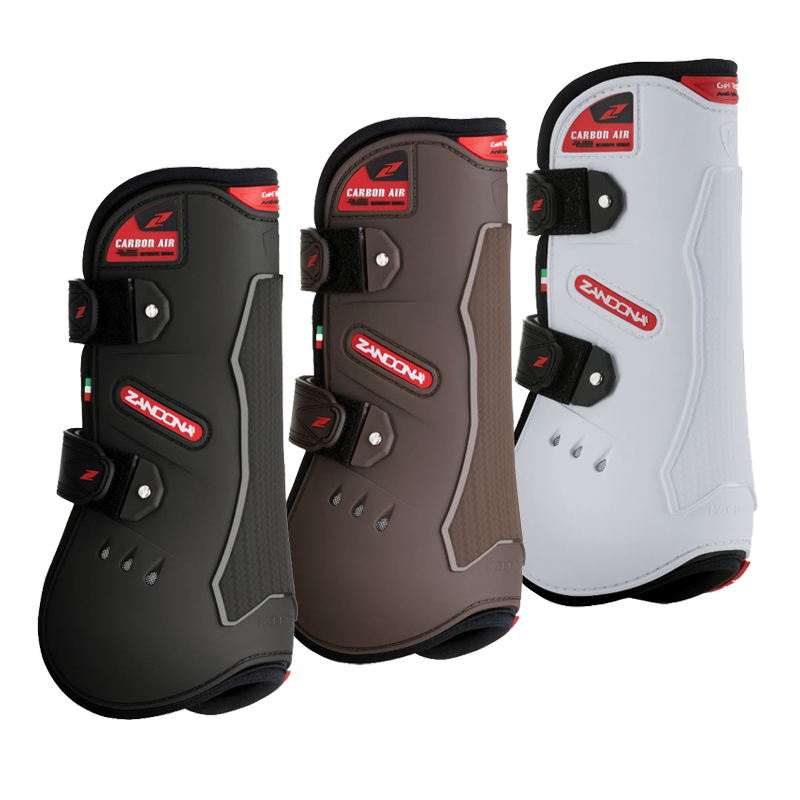 The 100% made in Italy "CARBON AIR VELCRO Tendon" have been studied to defend jumping horses from collisions and bruises at forelimb's fetlock and part of the cannon, while offering tendon support. They are composed by external TPU structure with differentiated thickness, transpiring thanks to the perforated Neoprene and ventilated by 6 Air-Vents located over the fetlock. Gel-Tech is included between the external TPU structure and the Neoprene support, where necessary, working as shock absorber and comfortable padding. Carbon Fibre elements are present under the shell to thermally insulate the joints from the heat generated by external friction, while increasing the mechanical resistance to impacts. On the internal side, closed to the long-pastern, have been created a Flex-Zone, necessary to allow maximum freedom of movement to the limb. A secure closure is guaranteed by Velcro straps, which are removable by quick-release system to be replaced when exhausted. Its dimension and absolute ergonomic shape have been developed copying accurately the limb structure, guaranteeing a perfect positioning while avoiding any kind of stress.